This popular panel game show ran on CBS-TV from 1950 to 1967. This is Sugar Ray Robinson – the show was shot on July 1, 1956 – almost 57 years ago. Sugar Ray is considered the greatest boxer of all time in any weight class by experts in boxing. The phrase “pound for pound” was invented just for him when they compare any boxer of any era. I am sharing a photo that he autographed for me at a local amateur boxing show in my home town of Santa Barbara, California in 1986. 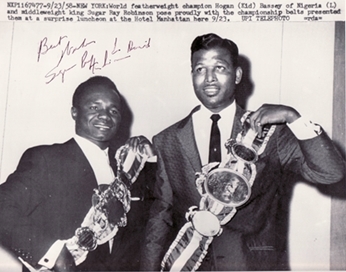 This photo was taken in New York on September 23, 1958; he is with Hogan “Kid” Bassey (left) displaying their world championship belts. Click below on link to view: What’s My Line episode. This popular panel game show ran on CBS-TV from 1950 to 1967. As a feature on dmboxing a different boxer will be displayed on a bi-monthly basis for viewing. 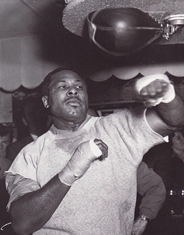 This month is Archie Moore – the show was shot on August 16, 1959. This popular game show ran on CBS-TV from 1950 to 1967. As a feature on dmboxing a different boxer will be displayed on a monthly basis for viewing. 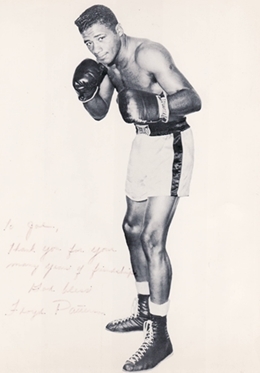 This month is Floyd Patterson – the show was shot on December 16, 1956. This popular panel game show ran on CBS-TV from 1950 to 1967. As a feature on dmboxing a different boxer will be displayed on a monthly basis for viewing. This month is Jack Dempsey – the show was shot on April 1, 1951. This popular panel game show ran on CBS-TV from 1950 to 1967. As a feature on dmboxing a different boxer will be displayed on a monthly basis for viewing. 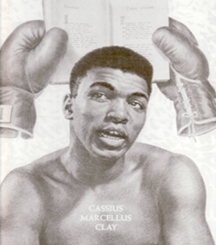 This month is Muhammad Ali – the show was shot on September 19, 1965.